Well I’m back. I guess I took a vacation of sorts. Since my Mom was visiting I took some time to hang out and just relax. Except we didn’t relax at all. If we weren’t out and about, we were cooking and cooking and cooking. I swear it was like America’s Test Kitchen. As soon as we would take a pie out of the oven we would put another back in. Sometimes it was the same type of pie, just a different crust. Ultimately in our pie-baking ventures, we concluded, crusts made with shortening are easiest to work with and taste the best. The butter crusts just didn’t compare. I really didn’t believe that would be the case but was so true. 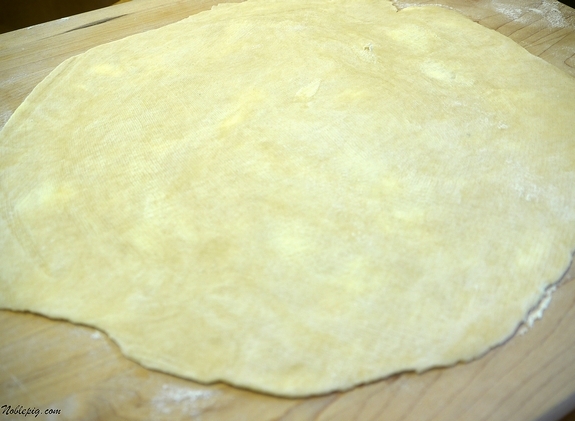 The shortening crusts were flakier and much easier to roll out. My Mom has always made her crusts with shortening and it was nice to finally do side-by-side comparisons. Shortening is definitely the way to go. When I was a kid, we always had Mom’s Mile High Lemon Meringue Pie. I was always impressed by the sheer beauty of this dessert. I could never understand how the fluffy topping could go in the oven and survive. This pie is a real show stopper when served. Not only is it beautiful, the custard is so lemony and nicely sweet. It’s a great contrast in the mouth and a pleasure to eat. It’s also so easy to make….you will love it. This is the same recipe my Mom has made for thirty plus years. I have no idea of it’s origin. I just know it’s fantastic! Believe it or not, the holidays are coming, it’s time to get your pie skills up to par. Get your rolling pin out and let’s make this together. I really believe pie crust can sense your fear. Be confident and you will have no problems. Using the scoop and sweep method add 1-1/3 cups all-purpose flour into a measuring cup and level. Add flour and 1/2 teaspoon table salt into a medium bowl and mix well. 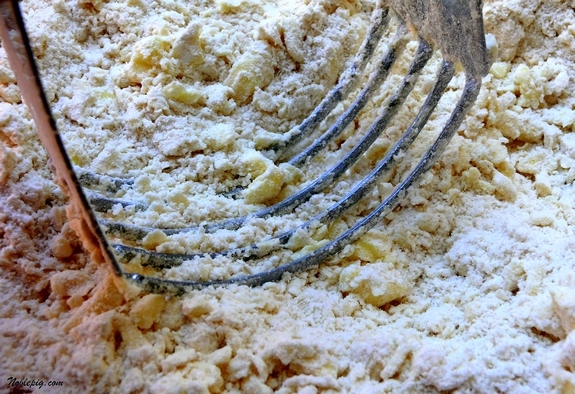 Using a pastry blender or two knives, cut 1/2 cup butter flavored Crisco into flour until all is blended, forming pea-size chunks. Be sure to do this very well, leaving no large pieces. Sprinkle with water, 1 Tablespoon at a time. Press together lightly with your fingers and form a ball and press into a five-inch pancake. Flour the dough very lightly and roll into a circle big enough to fit a 9-inch pie plate. I think it is easier to roll the dough between two sheets of wax paper but that is up to you. Carefully fold the dough in half and place it in the pie pan, flipping the other half over to completely fill the edges of the pie plate. Gently press the dough to fit into the bottom of the pie plate. Fold the edge of the dough under itself on the rim. My Mom uses her middle finger on one hand and thumb and middle finger on another hand to flute the pie edges. Thoroughly prick bottom and sides of crust with fork to prevent shrinking. Bake at 425 degrees for 10-15 minutes or until lightly browned. While the crust is cooking, make the filling. In a medium-size sauce pan, mix 1-1/2 cups sugar, 3 Tablespoons cornstarch, 3 Tablespoons flour and one pinch of salt. Slowly add 1-1/2 cups water until well blended. Bring to a boil over medium heat, stirring constantly; cook 3 minutes. Remove from heat. Slowly pour half of mixture into six, slightly beaten egg yolks, stirring constantly. 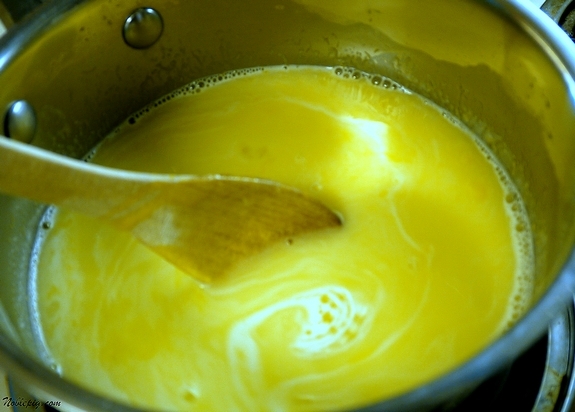 Slowly pour egg yolk mixture back into hot mixture, stirring constantly. Return saucepan to heat and bring to a boil, stirring constantly, cooking two minutes more. Add the zest of two lemons, 6 Tablespoons lemon juice and 3 Tablespoons butter. Cook 2 minutes more, stirring with a rubber spatula. Do not let the mixture stick to the bottom of the pan. Once done it will be very thick. Cover the pan and remove from heat; keep warm while you make the meringue. I used my Kitchen Aid mixer but a hand held mixer will work fine too. Beat six ROOM TEMPERATURE egg whites and 1/2 teaspoon cream of tartar until foamy. Beat in 3/4 cup sugar, 1 Tablespoon at a time. Beat in 1 Tablespoon vanilla extract and continue beating until egg whites hold a soft peak. 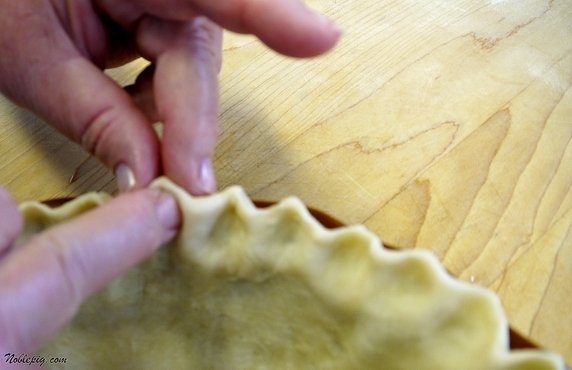 Add warm filling into baked pie shell. Dollop meringue all over the top of pie making sure the meringue touches the fluting on the pie shell. Bake in a 350 degree oven for 15 minutes or until meringue is golden brown. Cool pie over-night in the refrigerator before serving. 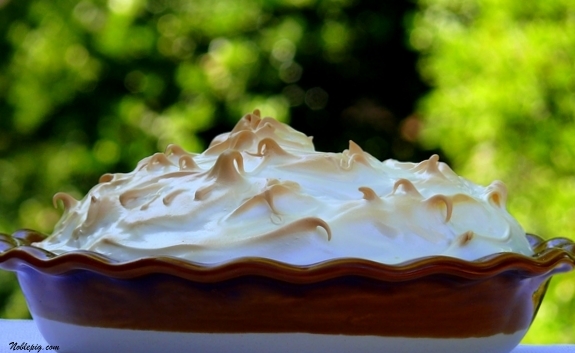 The golden brown edges of the meringue make this pie stunning. Carefully fold the dough in half and place it in the pie pan, flipping the other half over to completely fill the edges of the pie plate. 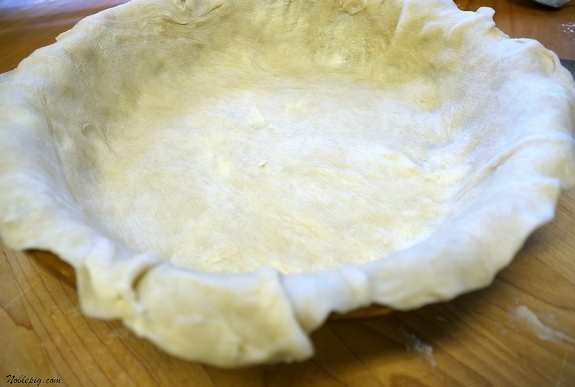 Gently press the dough to fit into the bottom of the pie plate. Fold the edge of the dough under it self on the rim. My Mom uses her middle finger on one hand and thumb and middle finger on another hand to flute the pie edges. What a fab looking pie Cathy, & better still, how nice that you shared your Mom’s recipe. What’s the diff between butter & shortening? Have I been living under a rock, or maybe, we just don’t get it here. Lovely post! OMG! That looks so delicious. My mum used to make a version that was scrummy but didn’t look as tall as that! I like her crimping too (fluting) – mine is never ever that pretty! What fun you two are having! Your mom’s pie is just gorgeous. 🙂 My mom makes a great lemon meringue pie, too. I’ve never made it. I’ll have to compare their recipes. I may make this when I’m back to baking a lot (it’s just been too hot). And, I love your mom’s fluting, too. Thanks for showing how she does, it. I usually cheat and use a tool, but hers is prettier. I have a question on this glorious pie. The pie plate that you bake this crust in, is it a regular 9″ pie plate or a deep dish? From the first photos it looks regular, but the side view looks like a deep dish. That does look mouthwatering. I love lemon pie. I haven’t made a pie crust in years. You may have just challenged me to start making them again. I’ll have to try pie crust with shortening… and this recipe. I love lemon meringue pie. One of my favs. This looks so amazing. That looks delicious! Can’t I just buy my pies from you? YUM YUM YUM! Being a Southern girl, I am partial to the shortening crusts;) So glad you had a wonderful visit with your Mom. Beautiful Pie! My mom always uses Crisco for her pie crusts! I think you’ve inspired me to make my own crust for a Tomato and Corn pie recipe that I’ve been wanting to try. Beautiful pictures! This is the same crust recipe I’ve always used, and you’re right…shortening is much better to work with than butter. I’ve made this crust recipe with butter when I was out of Crisco, and it’s not as easy to work with and doesn’t come out quite as nice. This pie looks delicious!! I can’t wait to try how she flutes her edges. Mine ALWAYS look terrible. I can’t wait until lunch time, I’m goinf to make some pie crust. I’m happy you got to spend time with your mom she must be very proud of you and your family. Can’t wait for my parents to come visit in two weeks! Sounds like fun to me! Sounds like you had a wonderful visit with your mom and shared some good kitchen time. Beautiful pie, especially that perfect crust. I am sooooo happy to have you back, but on the flip side…glad you and your Mom got to spend some wonderful time together!! That pie looks so delish…but I must look away. I must. It’s hard…but I have to do it. Dang…it makes me keep looking at it. Cathy that looks so delicious, I want some right now. I don’t want to cook it, I just want you to send me a piece of yours. Lemon Meringue was always my dads favorite pie. When my mom made it, she always had to make 2 – one for company , one for my dad, lol. 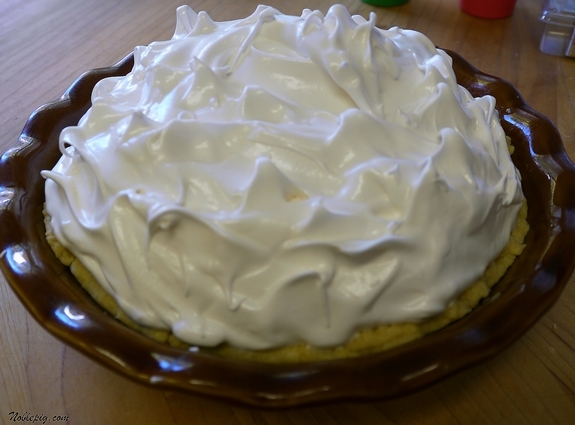 Lemon pies aren’t really my thing, but they were alwasy piled high with meringue! your pies looks yummy! Ok, get rid of the Crisco. Seriously, hear me out on this one. (Lard gets a bad rap) Our bodies can’t even process that stuff. Find yourself a nice little hometown butchershop that will sell or give you lard to render. Render it in the crockpot. Put it in there, set it on low, go to bed. Next morning, strain it through cheese cloth. Easy. Don’t try to do it on the stove or such. THEN, make pie crust. You will not believe the difference. And PLUS….there are amazing mexican dishes to be made from those leftover cracklings. Trust me. Do it. The picture of the “plated” food is the one I always wait for….and this did NOT disappoint. What a gorgeous pie! I, too prefer to use shortening for my pie crust and the butter-flavored shortening gives enough hint of butter to please. It sounds like the two of you are having a great time. You can’t ask for more than that. Beautiful pie! I always love a Crisco crust…it’s so much easier and tastes better in my opinion! What a gorgeous pie! Give me lemon or lime ANY time over chocolate. Thanks for sharing! OMG…seriously, who has time for that? Most women would never make pie again if they had to do that! LOL! It’s a beautiful pie – so light and delicious! Oh golly that looks good! I love those family cooking marathons, and can’t wait to see what you made! Hope you’ll post all! The pie looks fantastic! Wow, it looks so delicious Cathy. better then the one you get from a bakery of course. Gorgeous Meringue! I’ll take a slice for breakfast please. Glad you had a nice time with your mom! fact: a slice of any homemade pie is one of the finest desserts to be had. period. i love that you and your mom could share the cooking experience! Beautiful pie! I can never get my meringue to look like that. Maybe I just need to make more! My mother never made a pie. I am pie-crust-phobic. I’m thinking of trying a lemon pie this week, since it’s only 58 degrees outside right now and it’s noon here. Wish me luck with my crust. Have you ever tried putting gelatin in with your meringue? It works well. Your pie looks delicious! Thanks for the tips on the crust. I can make a crust that tastes good but cannot seem to make a crust that will stay in place while baking the pie shell. That meringue topping is to die for. Love the texture of a meringue pie. Need any second opinions. I’ll help with the taste testing! My mom ALWAYS uses lard…but we bought it from the store. Look for the green box (sometimes says manteca, but that’s just spanish for lard). THIS is the ultimate crust! Lemon meringue pie beats every other pie hands down in my books. Look at that luscious meringue. I know Crisco is easy to work with, but it is a modified food. I agree lard is fat yes, but it is not modified, and making a strong come back. You can render safely by simmering the suet in water. Lemon Meringue pie, is there anything more uplifting? Tart, creamy, yummy. Hey I have some lemons in the fruit bowl right now…….. Welcome back, missed you but hey, blogging is way down on the list when it comes to family and time with family and friends. Plus, you were baking ! Pie-crust really is my specialty in the realm of baking, and I have been told I make an excellent ( and yes, a prize winning ) crust. You’re right, shortening makes the BEST crust, but if you’re making a pot pie, butter tastes the best! I make butter crusts for pecan pies too. I think I must make this pie. By the way, we met your twin at the local county fair! I had to make sure there weren’t 2 boys along with her before I was certain it wasn’t you. Nope, she had a boy AND a girl along.After my Hubby agreed she did indeed look like you we mentioned your blog and wine country, etc,/ and she declared she LOVES Pinot Noirs and she and her husband love Oregon Wine country ( he is from Portland) so maybe a long lost relative? Anyway, she said she would be checking out your blog. So, how often are we really eating pie. Does every so often mean we can’t use Crisco? My mother has been using a Crisco recipe for what seems like 50 years. We are all still alive and healthy. I used to have a huge fear of making pie crusts but have finally conquered that. That is some awesome looking pie. I will have to try that. And you are right about shortening. It’s definitely the best type of crust. Shortening? Who knew!? I’ve never tried that–but will. That pie sounds soooo good! Stunning pie Cathy. Doesn’t it always taste better when Mama makes it!!! What fun with your Mom! I love watching America’s test kitchens on my local PBS station. 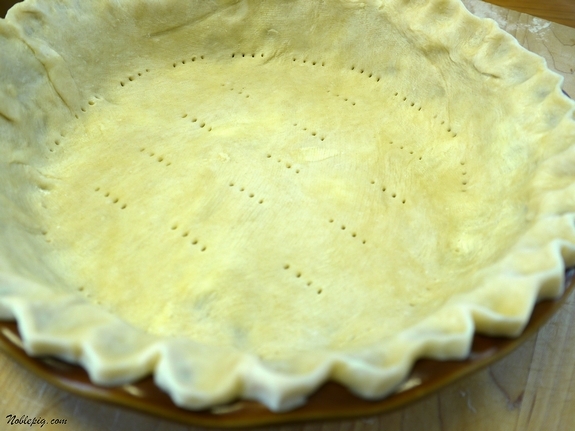 Definitely agree with you on the shortening in the pie crust – it always rolls out so much easier than a butter crust! Love the lard converstaion above, yup it is making a come back as my mom has bought some to work with. I’ll stick with Trader Joe’s crust- I am that lazy! So nice to cook with moms! Reminds me of the pies my grandma used to make. I was always in awe of how tall her meringue was! Just beautiful! Yay. We’re finally seeing the actual pies you’ve been statusing about! Yummy. I usually make my pies with about a 60/40 ratio of shortening and butter. Shortening is easier to work with, but I like the flavor of butter. I don’t know why I never considered butter-flavor Crisco. I wouldn’t worry about the Crisco naysayers. My mother, thin, healthy, and riding horses and teaching yoga at 68, said growing up it was the main cooking oil in the house. Yummie, this lemon pie looks so tasty…nice pictures! That is GORGEOUS! 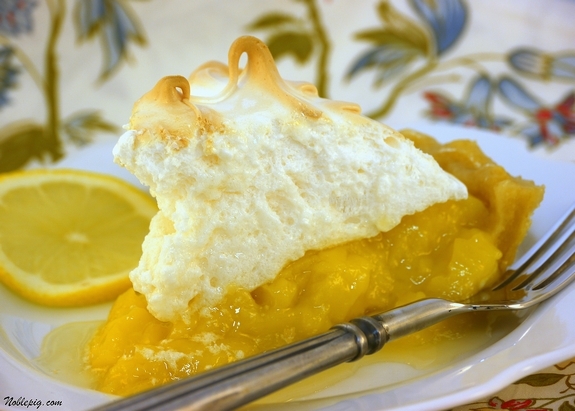 Lemon Meringue is one of my favorite pies!! 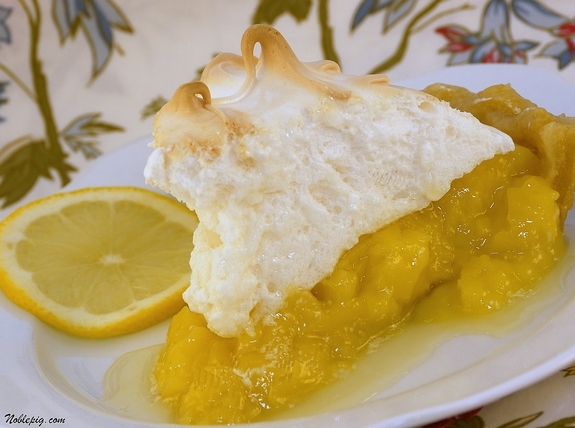 Lemon meringue is a classic for good reason. Looks great! Your lemon meringue pie looks great. I’ve come to the same conclusion as you about pie crust. I made lemon meringue pie recently and it was sooooo good! I’m glad I finally tried it again. This looks yummy! I think I’ll give that pie crust a try…and I agree with the shortening over butter-the bakers in my family have always said that! Thanks! Wow! What a gorgeous and wonderful sounding pie! I have to try this for my mother in law- lemon meringue is her fave. Thanks for the recipe and the pie crust tips! I know you are busy, but wasn’t sure if you saw my question I posted above. 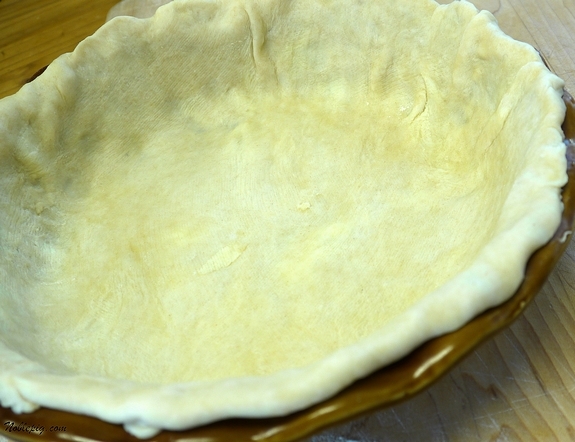 The pie plate that you bake this crust in, is it a regular 9″ pie plate or a deep dish? From the first photos it looks regular, but the side view looks like a deep dish. Lemon Meringue is my husband’s FAVORITE pie. I am inspired to make him one now! Oh sorry. It’s a regular pie plate. Thank god for you! I have been CRAVING lemon meringue pie and searching for a recipe. You just made my day. ok this one is killing me. I will have to save it for a special occasion. It sounds like lemon curd for the filling, yummy. You could try some spectrum shortening and see if you get as good of results. I haven’t figured out the sugar thing yet. But For white flour King Arthur’s is the best. See you are not as old as I am and are not sick a day. It makes a difference, how you are feeling. Cars and houses are not cheap and not everyone can buy it. Nevertheless, mortgage loans are invented to aid different people in such kind of hard situations.